8x8 positioned as a challenger in 2018 Gartner Magic Quadrant for Contact Centre as a Service, North America | 8x8, Inc.
SAN JOSE, Calif.–(BUSINESS WIRE)– 8x8, Inc. (NYSE:EGHT), a leading cloud technology provider of voice, video, collaboration and contact centre solutions for over one million users worldwide, today announced it has been positioned by Gartner, Inc. as a Challenger in the 2018 “Magic Quadrant for Contact Centre as a Service, North America”¹ for the fourth year in a row. 8x8 was also recently recognised in the 2018 “Magic Quadrant for Unified Communications as a Service,Worldwide,”2 which the company believes affirms its ability to execute and its completeness of vision in each market. The 8x8 contact centre solution is one key element of 8x8 X Series, a single-vendor cloud solution for voice, video, team messaging and collaboration, and contact center across mobile and desktop devices. 8x8 launched X Series in 2018, and was recently named a Leader in the 2018 “Magic Quadrant for Unified Communications as a Service, Worldwide”2 for the seventh time in a row. 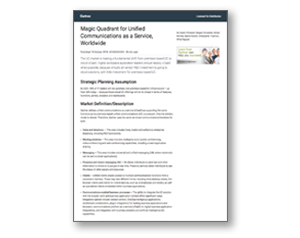 Get a complimentary copy of the 2018 Gartner Magic Quadrant for Unified Communications as a Service, Worldwide2 report. Gartner “Magic Quadrant for Contact Centre as a Service, North America” by Drew Kraus, Steve Blood, Simon Harrison, Daniel O’Connell, October 17, 2018.